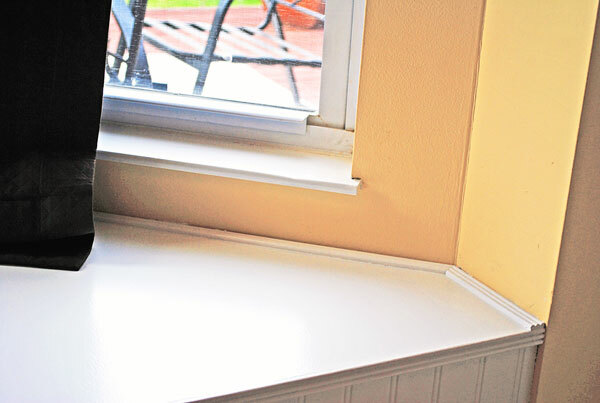 My window seat is done…and I am so excited to share it with all of you loveies! 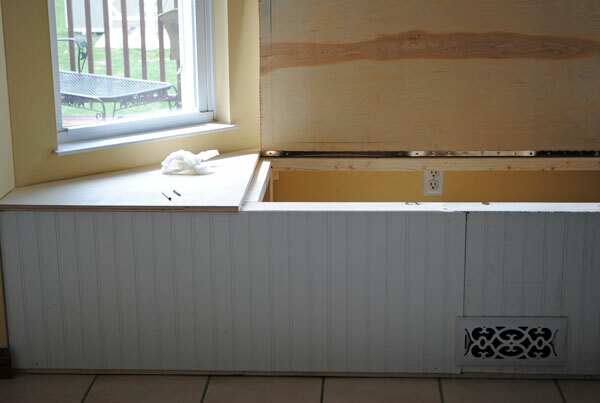 So…as most of you know I am knee deep in a kitchen remodel. 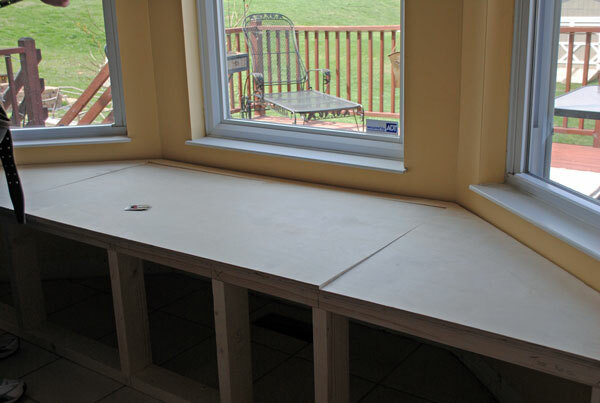 Step One: The removal of the ugly, hideous no one would ever plan anything in this space planning desk. 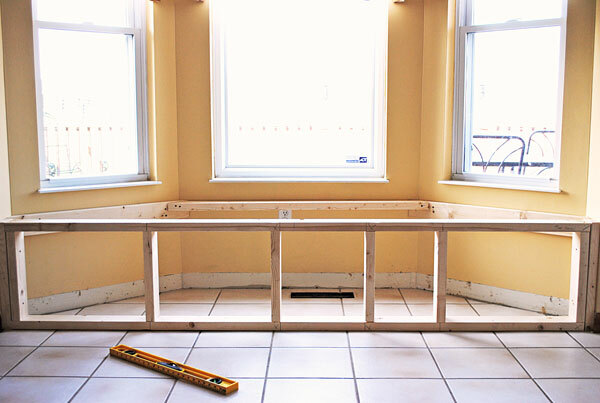 For several years now I have envisioned a window seat in the bay window in my kitchen. 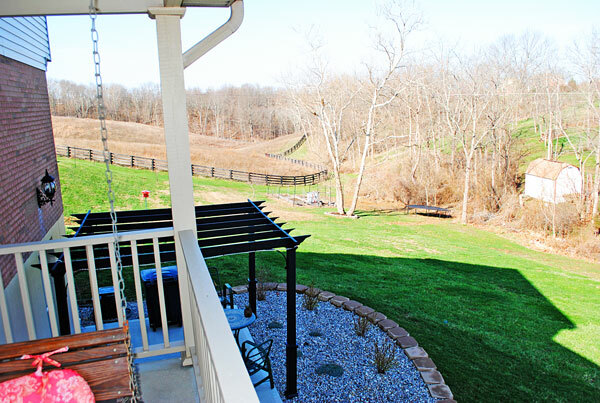 We have a beautiful 2 acre backyard, and I imagined sitting up in a window seat drinking coffee and looking out over the farm land and woods behind my house. 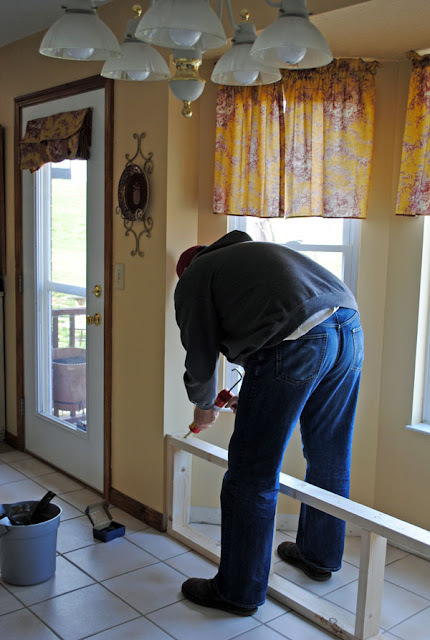 Once I begged and pleaded convinced Bama Boy to finally take on remodeling the kitchen, my second demand request after tearing out the non functioning planning desk was building my window seat. But, regardless of who actually built the window seat, I now have one…and I am one happy gal! First step was framing out the actual seat. Will measuring out the frame. Everyone needs a Will for a neighbor! It didn’t take long to imagine what the window seat was going to look like! Now we were dealing with two issues with the location of the window seat. Can you guess what they are? I’m sure you see them. Yep, a vent and an outlet. Here’s what we did. First, we left the outlet in tact but put the back support above it. That way I can still access it if I need it. The vent required some thought. We used a nice piece of birch to construct the window seat. 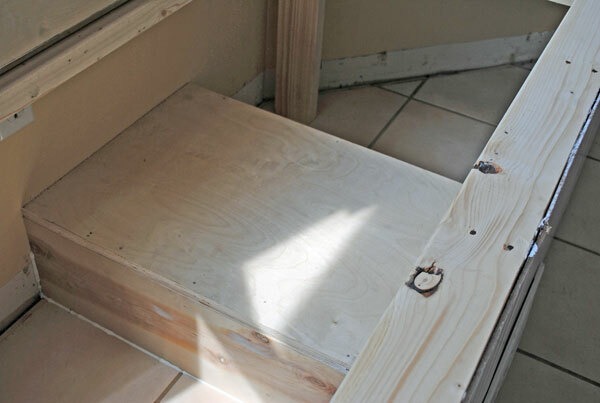 We measured the space between the 2X4 braces and the boys cut a door out of the plywood. Then we attached the longest piano hinge we could find. You can purchase these at Lowes or Home Depot. 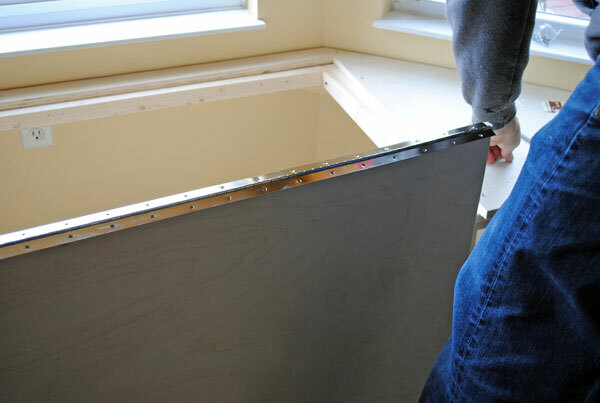 This hinge was the perfect length, but if you find it’s a little long for your window seat door it can be cut to fit. I just love it! I can’t wait to get all of the pillows on it. We are going to leave the seat uncovered for now, since we realized that our dogs would be up here quite often….the muddy footprints on it already were a good indication of this. So for now, it won’t have a seat cushion but I will have lots of pillows to snuggle up with and to rest against while eating. I can’t wait to share more pictures of it with you when the kitchen is complete. 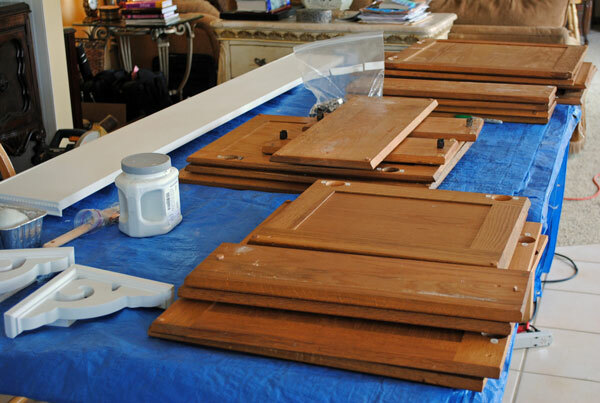 Now, we’re onto Stage Three..painting the cabinets! 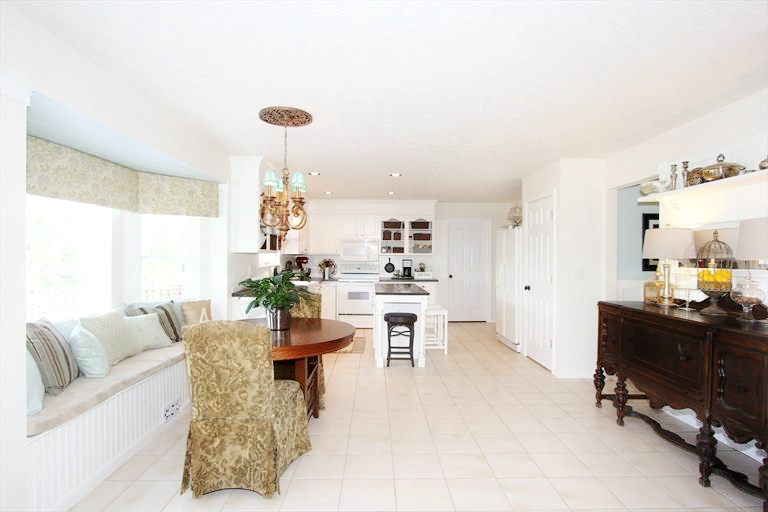 Here are links to the kitchen makeover! You can also see my kitchen makeover featured in Better Homes and Gardens. 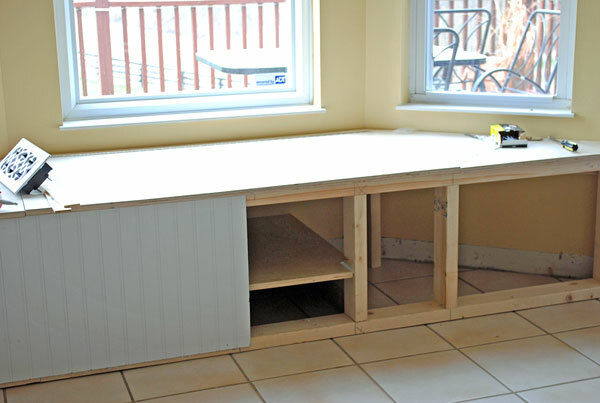 35 Comments on "Build a window seat yourself!" That is so completely awesome – i LOVE CAS!!! I can’t wait to hear from her and see what she picks out from my store. Thanks again and have a great week. Wow…what an undertaking. I love the window seat. Can’t wait to see it “all dressed up”. I also can’t wait to see how those cabinets come out. I bet it’s going to be amazing. It looks great! My husband built one in our old house and I LOVED sitting on it. I’m sure you will love it, especially in the kitchen. Before I forget: Congrats to the winner! Now, about the window seat. I love it. I’m such a huge fan of them. We have them in dormer windows upstairs but I’ve always like the look of one in a kitchen. Oh it looks wonderful! I cant’ wait to show the hubby and start begging…. Crazy awesome window seat! I totally want one now! So lovely! We have a window seat and we LOVE it! It looks great! I am featuring this at somedaycrafts.blogspot.com. Grab my “featured” button. Well, first off, congrats to Kim for winning the give-away! Secondly- WOW! Love it-I have a window seat in our dinette area and we absolutely love it. AND SweetCheeks uses it as a “stage” for her American Idol performances…no surprise there, huh? How exciting! You had the perfect window for that too. Can’t wait to see it all finished. The window seat looks great! My husband built a similar one for my in-laws for Christmas. It’s a lot of work but they are so fun! Looking forward to the cabinets! You’re really going to enjoy your window seat, Heather! And that view! Oh, my! You are so fortunate! That is beautiful! Heather it is beautiful!! I have always wanted a window seat but no such luck here. Your backyard is gorgeous and I love your pergola! Have fun sipping coffee and watching all go by while you bask in the warmth of the sun. 🙂 Or at least it is a great break spot from painting cabinets. 🙂 Can’t wait to see! 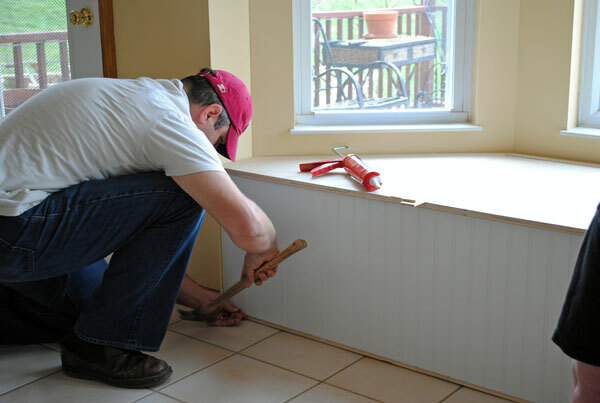 Great construction project, and some excellent tips as well. I’m lovin your window seat..they did a fabulous job on it. Cool…you’re my first link of the night. Thanks for sharing this awesome post at the party. It looks great! 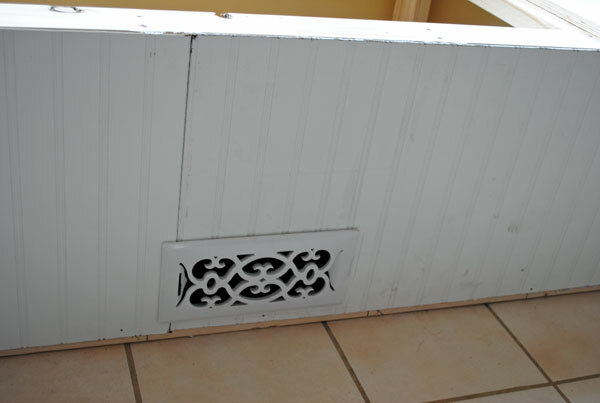 I love the vent…way to dress something up that you have to have, right? Great tutorial! 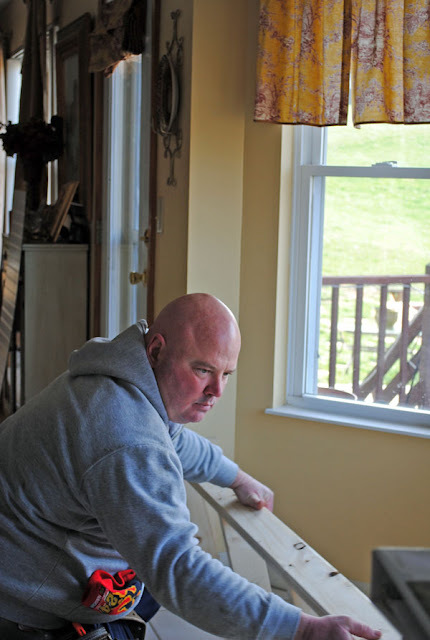 I can’t wait to see your kitchen cabinet redo. 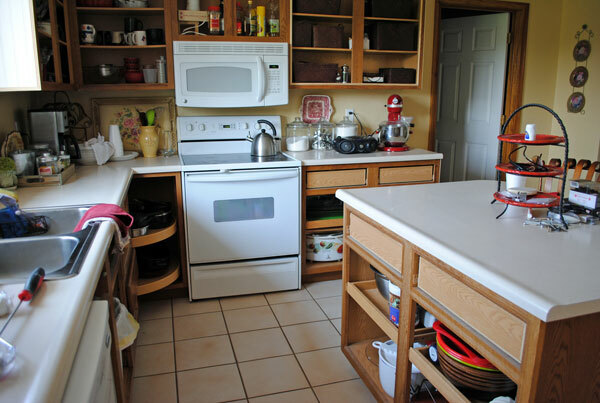 I have the exact same cabinets and psyching myself up to tackle them…someday. I am looking forward to hearing about the process and hearing what it was like DOING and LIVING in the process! Beautiful! I wish I had a bay window so I could have a window seat too! I love your blog – check mine out if you like! I’m loving the window seat, so cozy! My husband and I painted and glazed our builders grade cabinets last spring. It was a big project & a lot of dust, but so worth it! Cant wait to see your transformation! Oh, Heather, it’s quite, quite lovely. I love those cushions…and extra storage is always a HUGE bonus, isn’t it? I’m always astonished at how much ‘stuff’ we have to store that we need in our everyday lives. 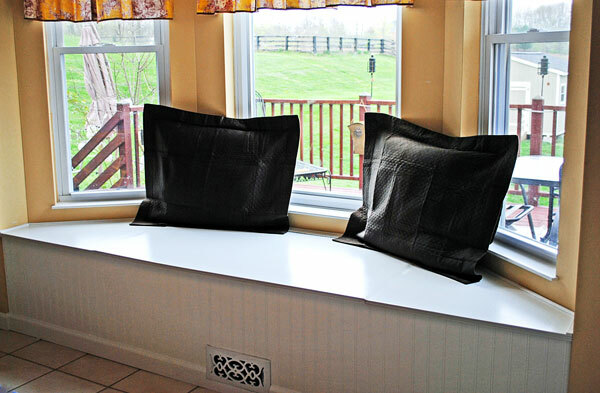 A lovely window seat like yours would be a perfect solution. What a great way to solve the furnace vent problem. I would love a window seat so I took careful note of how you did it. It’s going to look gorgeous with the cushions on it.